Well, here we are. Season Four of Breaking Bad is over. In total, it did not disappoint as it was another great season from the best drama on television. Last week's episode ended with Walt and Jesse failing to kill Gus, and it was pretty much a guarantee that by the end of this season, Gus was either going to have to be dead or, at the very least, in jail. That or Walt and Jesse were going to have to disappear, which seemed unlikely to me. I had my thoughts on what might happen as the season wound down. A lot of it turned out to be incorrect, but I don't care because it was incredibly entertaining. Even though this episode was pretty much just about Gus, Walt, and Jesse, with pretty much everybody else left on the fringes, it was still filled to the brim. Well, Hector was also involved quite a bit, but I shall get to all of that momentarily. For once, one of Walt's plans managed to be fairly successful, even if his plan to blow up Gus' car didn't work. With Jesse detained for a lot of the episode (I'll get to that later), Walt was pretty much on his own in trying to find a way to kill Gus. Fortunately for him, he managed to fine an unusual ally in Hector "Tio" Salamanca. That one scene where Gus took Jesse with him when he went to taunt Hector after he killed all those cartel members finally had a reason to exist, as it allowed Walt to find a place to leave a bomb that Gus doesn't have cameras on. Hector took a visit to the DEA to talk to Hank, but that was only to alarm Tyrus, who in turn informed Gus. This gave Gus the motivation to finally kill Hector. While Gus was still careful and cautious, it seems also fair to say that he let his desire for revenge cloud his judgment a bit. Gus and Tyrus enter Hector's room, and just before Gus can inject Hector with something to kill him, Hector starts ringing his bell, but only now it is a trigger for the bomb, which is on his wheelchair. Gus realizes what's going on a moment too late, and the bomb explodes. The next thing we see, improbably, is Gus leaving the room and straightening his tie. However, the camera pans over to show us that Gus is pretty much missing half of his body, apparently he turned before the bomb exploded, and then he drops dead. Hector got his revenge on Gus, not the other way around, and three of the most vile people on the show are now all dead. More importantly to the course of the show, Walt and Jesse are now likely safe. I really liked the way this all played out. Getting Hector involved was an interesting choice, and the tension between Hector and Gus, even with Hector's inability to speak and limited facial movement, was intense, especially in that last moment before Hector exploded the bomb. As for Gus' death, Breaking Bad brought out one of its trademark very darkly comic moments in the image of a charred Gus adjusting his tie. It was great, even if it briefly resembled a scene from the movie Death Becomes Her. Plus, it sort of played off the whole "Gus as Superman" aura that had built up around him. For just a brief moment, it seemed like he somehow had managed to survive. Fortunately, he did not. It was a fittingly dramatic death for one of the best antagonists in television history. While it is a shame to see such an excellent character depart, it had to happen. The storytelling built up to this point, and he had to go. It's the nature of having a television show. While I will miss Gus, from a plotting standpoint I'm all for it. It was a great big moment to end the season, even if it didn't end the episode. With Gus and Hector now gone, it is pretty clear who the worst person on the show is, and that is protagonist Walter White. Granted, we already new Walt was a bad person headed into the episode. He let Jane die, he had Gale killed, and, you know, he is a meth kingpin. However, we found out that Walt has a whole new level of awfulness in him. After killing Gus, Walt headed down to the superlab, where he dispatched with two of Gus' henchmen, and then he and Jesse proceeded to burn down the superlab, and in term the laundry I assume. Suddenly, Walt and Jesse were a team again, and I really enjoyed just how in sync they were when they burnt down the superlab. Then, we find out that Brock is going to be fine, and that he wasn't poisoned by ricin, but instead by some berries called "Lily of the Valley." At this point, I thought what the show was saying was that Gus didn't poison Brock, but instead that it was an accident. As such, Jesse took part in killing Gus on a false presumption, and that could have ramifications with a guy like Jesse who doesn't like the uglier parts of the meth trade. However, that turned out to be incorrect. In the final moments of the episode, the camera pushed in on a plant in Walt's yard, and we find that it is Lily of the Valley, and there is not a berry left on the plant. The message is clear: Walt did, in fact, poison Brock in order to pin it on Gus and turn Jesse. So, clearly, Walt's successful plan was even bigger than we realized. In this episode, Walt also sent one of his neighbors over to his house to see if there was anybody there waiting for him. Indeed, there were two thugs there, but fortunately they did not hurt the woman. This moment was kind of darkly funny, I thought, but the poisoning thing is very different. 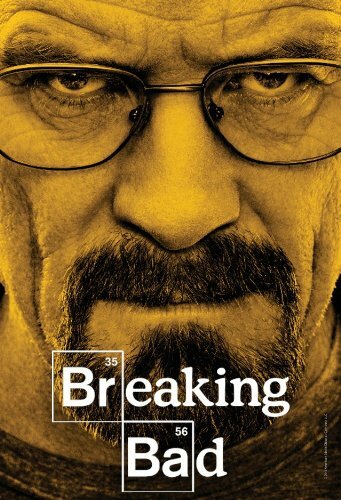 Walt may very well now be both the protagonist and antagonist of Breaking Bad. This was an interesting twist, and given that there are only 16 episodes left in the show I don't mind them making this big move at this point. Had they had Walt do something so awful earlier inthe show, I think it could have hurt it. At this juncture, it works for me. Will Jesse find out? Or will this be like Jane? Or will Jesse also find out about Jane eventually? Anyway, this was a game changing moment to end the season, perhaps even more so than the death of Gus. I already mentioned Hector earlier, but I wanted to mention him again because he had a particularly good episode. The show spent a ton of time with him and his nurse as he rang his bell along with a letter chart to communicate. Seriously, the show spent at least a couple of minutes on this. While, in a way, I admire the audacity of the show for committing to it, it did drag on a bit. I also enjoyed the fact that Hector's visit to the DEA just involved him insulting them. Getting to mess with the DEA and kill Gus? No wonder Hector went along this plan. While I won't miss Hector as much as Gus, I will miss him as well. Of course, as well know at this point, there is a good chance both Hector and Gus could be back in a flashback. Jesse spent a fair portion of the episode with a couple of police officers who questioned him about why he mentioned ricin as a possible reason for Brock's condition. There was even talk about getting the FBI involved. Jesse tried to claim he saw ricin on TV, and eventually Walt did manage to get Saul to show up to help Jesse out to a degree (after a funny scene involving Saul's secretary), but in the end what saved Jesse was the fact that it wasn't ricin. However, I think there is a chance that law enforcement won't be done with Jesse after this. It is something to look for next season. That's what I'd like to do now. Season four is over, but where do we go from here? My main question is what now for Walt and Jesse? Gus is dead and they have no more superlab. Will the continue to cook? If so, how? Who will distribute it? Will Walt try and step into Gus' shoes? If he does, will that get the cartel on his tail? Also, where do Walt and Skyler stand now? She knows he killed Gus, and she is seeing a clearer and clearer picture of the man Walt is. Will she flee? Or is she in too deep now? I expect Hank to continue his search for Heisenberg. Yes, Gus is dead, but if Walt and/or Jesse continue to cook, eventually the blue meth will resurface, and that will get Hank's attention. Plus, without Heisenberg to search for, what would Hank do on the show? Additionally, there is the question of what happens with Mike. His boss is dead. What does he do now? Will he become muscle for Walt and Jesse? Does he seek revenge for his old boss? The latter I find unlikely. Mike is a businessman, much like Gus was. My guess is that with Gus dead he'll just move on. Will a new antagonist rise to square off with Walt and Jesse? If so, it would take a few episodes to build to it, even if it ends up being the cartel. I am also curious as to how the show will deal out the final 16 episodes. Will it be one big season? Or will it be two eight episodes season? I would personally prefer one, 16 episode season five, but that may be logistically difficult. 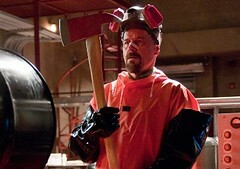 One thing I feel sure about is this; I think Jesse needs to kill Walt. At this point, I think that would be the best way for the show to end. Walt needs to die before the series ends, and with what Walt has turned out to be, and with what he's done to Jesse, that would be the most fitting ending.